What Color is a Cashmere Goat? UNDYED AND NATURAL DYESPure fibers that either skip the dyes or rely on natural ingredients such as petals, leaves and bark. 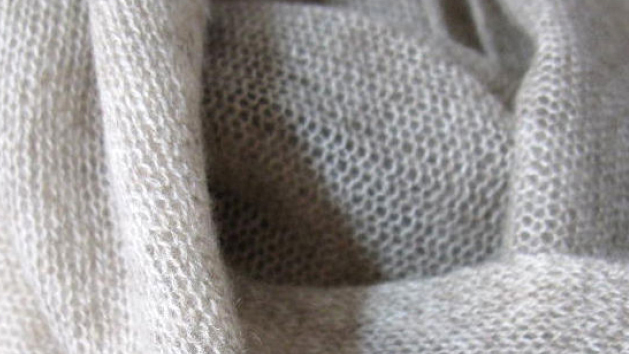 Sweater designer Sheree Lee talks about Mongolia, nomads and our Undyed Cashmere sweaters. In Mongolia, the land of the cashmere goat is vast and windswept, with grassland stretching towards an endless sky. Goats wander and graze, wearing coats of brown, gray and white. Several years ago, sweater designer Sheree Lee visited Mongolian nomads as part of a trip that brought her through our supply chain. "The land is majestic—I felt engulfed by the sky," says Sheree. "And the silence. It was both eerie and comforting." She's reminded of her travels every time she designs with Undyed Cashmere. "The yarn has beautiful nuances in a range of five colors," says Sheree. "And the feel—it's just incredible next to your skin." Since it is undyed, the fiber goes through less processing. Color isn't stripped out and added back in; it reflects what already exists in nature. Our Undyed Cashmere comes from Mongolia, a landlocked country surrounded by China and Russia; it is often referred to as Outer Mongolia to distinguish it from the adjacent Chinese region called Inner Mongolia, the source of our conventional, dyed cashmere. Animal husbandry is central to Mongolia's economy, as has been the tradition for centuries. Nomads herd flocks of cashmere goats, shifting their grazing grounds in summer and winter. In the last decade or so, the ranks of Mongolia's nomadic herders surged, altering the balance of goats to grass and causing desertification from overgrazing. Then came the dzud of 2009-2010. Dzud, a Mongolian word for a harsh winter, is a well-known hazard. But that year winter was flat-out brutal, leaving 2.7 million livestock animals dead. According to our Mongolian cashmere supplier, experienced herdsmen who knew how to prepare for the cold were able to survive; newer nomads suffered, many abandoning herding and moving to Ulaanbaatar, Mongolia's capital city. At least for now, this tragedy has a silver lining—fewer animals on the land. But within this shifting and complex supply chain, there are environmental challenges beyond overgrazing that are disturbing: Both Inner and Outer Mongolia have been discovered as lucrative grounds for coal mining and rare earth minerals. Meanwhile, goats continue to graze and Undyed Cashmere continues to be a luxury fiber. "It is an honor to design with this fiber," says Sheree. "It has such a direct connection to a powerful landscape."